We all experience changes to our bodies as a natural part of growing older. Adapting to these changes can be challenging. While we cannot stop our body’s aging process, we can proactively address the physiological changes that occur in order to reduce the impact of aging on our general health. Commonly, mobility and balance are affected adversely by our aging bones and joints. As balance and mobility become compromised, this can lead to falls. One out of every three Americans over the age of 65 has a significant fall each year, according to the U.S. Centers for Disease Control and Prevention (CDC). Among individuals age 65-84, falls account for 87% of all fractures. Although many individuals may experience problems with their equilibrium as they get older, one of the main causes for a decrease in coordination and balance correlates to decreased muscle mass. 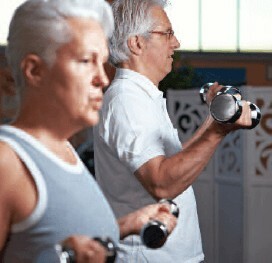 As we age, we lose muscle mass (the weight of our muscle) if we do not exercise. A loss in muscle mass translates into decreased strength, flexibility and agility. Additionally, bones tend to shrink in size and density with age, weakening them and putting us at risk for osteoporosis (brittle bones) or broken bones. Research has proven that exercise at any age should improve our health. One such study showed that after participating in an exercise session just three times a week for 20 weeks, participants in their late 60s increased muscle strength. Moreover, the study’s older participants increased blood flow to their legs that was comparable to that of study participants in their late 20s. Blood flow, or circulation, carries oxygen and other nutrients to all the cells in our body, including our lungs, and also rids our body of carbon dioxide and lactic acid. In the process of circulation, endorphins also are released. Endorphins are biochemical substances which help the body naturally relieve pain and can bring about a feeling of well-being. Improved bone density and joint health—Strengthening muscle mass places healthy stress on bones which prevents joints and bones from breaking down. Adding muscle tissue through strength training, such as using free weights, helps reduce the chances of osteoporosis, arthritis, joint injury, loss of balance and falling. A healthy metabolism and prevention of weight gain—Muscle burns twice the amount of calories as fat tissue, so by sustaining muscle tissue through proper nutrition and exercise, a healthy metabolism is maintained. In turn, a healthy metabolism can prevent extra weight gain as well as reduce the risk of heart disease and diabetes. Improved strength and balance—An exercise as simple as walking helps keep leg, back and shoulder muscles active and working. This maintains overall flexibility and balance, thus reducing risk for serious falls. If you are looking to begin an exercise routine, feel free to consult our office. We can recommend reputable resources to help you get started safely. The benefits of exercise for every person at every age are well documented. The type of exercise you select is not as significant as the fact that you are doing something to contribute to your long term health and wellness. The post Exercise – A Key Component to Healthy Aging appeared first on Specialdocs Consultants.